Where do I use my Leader Floors voucher code? Select the offer of your choice from NetVoucherCodes. Follow the link to the Leader Floors site. Browse the Leader Floors site and fill up your basket. When you have finished shopping, go to the checkout. Click ‘Got a Discount Code?’ enter your code and select ‘Apply’. Select ‘Proceed to Payment’ to complete your order. "Free delivery on orders over £199." "0% finance available on all orders over £300." Leader Floors is one of the leading online flooring stores in the UK. They offer a wide range of flooring products for both home and business environments at great value for money prices. Shop here for flooring in a range of finishes including solid, wood, laminate, vinyl, engineered and high gloss. They offer free flooring samples and every order comes with a 14-day no-hassle money back guarantee. Their online price promise means that they will not be beaten on price and delivery is free with a minimum spend. Using a Discount Code from Leader Floors is a great way to save money when you are purchasing new flooring. The codes will give you a saving when buying selected products such as "Save 10% when you buy Falquon Flooring" or "Get a 15% saving on Balterio Laminate Flooring" or they might give a discount with a minimum spend like "Get 10% off when you spend £300 or more". Just enter the code at the payment stage to get an instant reduction to your final bill. Here at Netvouchercodes, we let you know about all of the discount codes and money saving offers that are available from Leader Floors, so be sure to check here before sending in your next order. 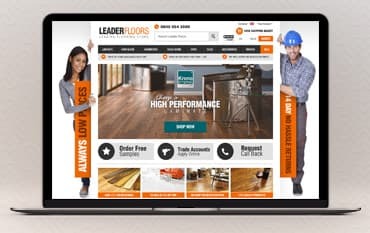 If you would prefer to visit one of the Leader Floors stores to see the product before placing an order then you can find the nearest store to you by using the Leader Floors online store finder. Simply enter your postcode to bring up the details of the store including address, telephone number, email address, opening hours and very useful driving directions from your home to the store. If the store is too far away, then why not take advantage of their free flooring sample service? You'll find rugs of all shapes and sizes at Leader Floors. Whether you are looking for traditional or contemporary designs, shaggy rugs, floral rugs children's rugs or even outdoor rugs, you'll won't be disappointed by the choice of designs and colours that's on offer here. As with all of the products available at Leader Floors, the rugs are offered at great value for money prices. To find your nearest Leader Floors store please use the store locator map. Delivery is free on orders over £199. For more information on delivery please look here. You have 30 days to return a product to Leader Floors if you no longer want or require your order. At Leader Floors, you will find an extensive range of high-quality flooring at competitively low prices. Whether you are shopping for your home or business premises, you are sure to find what you need here. Use a Leader Floors voucher code and save on Laminate Flooring, Solid Wood Flooring, High Gloss Flooring, Vinyl Flooring and Carpet Tiles.